03/03/01 -- Well, it's been a while sine I first published this page on collecting US Made all-metal toy Broncos & Ford trucks. Ever since I found the fist toys in my collection in that little thrift store in Atlanta, GA. I've been hooked! Since that time I have found several more toy Ford trucks so I thought I'd share my treasures with you! The picture to the right shows the big Ford trucks I currently have. The first one is a 1980 NYLINT County Fair 1979 F-150 complete with horse trailer. It's in near mint condition! The second one is a 1980 NYLINT "Sports Car Special" model 1060 1979 Ford Bronco. The third one is a 1981 "Bass Chaser" 79 Ford Bronco. I have one additional toy Bronco, a 1983 NYLINT "Army Command Car" 1983 Bronco II, which was one of the first ones I found in the thrift store. I'm still trying to grow my collection, and as I find more I'll continue to publish them here. So where can you find these awesome toys at? 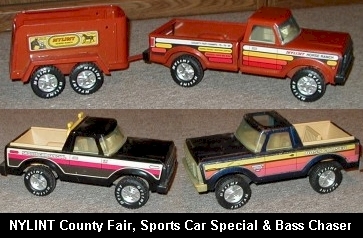 Well, I'll let you in on a little secret; I found both the "County Fair" F-150 and the "Bass Chaser" Bronco on Ebay! Just click on the ebay link and do a search for "NYLINT Ford" and you'll see pages & pages of NYLINT Ford truck toys for sale! Have fun! Here are just some of the NYLINT toy Fords that I'm looking for on Ebay. Many of these toys can be found there, some of them still in the original box! This is a photo of a 1979 Bronco model 1060 made from 1980-1984. It was sold as the "Cadet Sports Car Special" seen in the photo to the left towing what looks like a 1979 Mustang race car. This is my favorite!!! It's the model 1020 Cadet Nylint Stables 79 Bronco made in 1979-1982. I sure would like to find one of these!!! This is the model 1010 Cadet Bronco made from 1979-1982. I have got to find one of these! Look closely at the front fender. It looks like it has the "Bronco Ranger XLT" emblem on it! This is the model 1040 Cadet Bass Tracker made from 1979-1983. Now how would you like to give your kids one of these for Christmas? This is the model 1050 Cadet Moto-Cross 79 Bronco made from 1979-1980. Why didn't I have one of these when I was a kid? This is the model 6848 Nylint Race Team made from 1980-1981. It looks like this set included a 79 Bronco pulling two Formula 1 race cars and a 79 F-100 Extended Cab pulling a Bike. This is the model 1070 Cadet Motor sport Set made from 1980 to 1982. Is that a Delorian the pickup is pulling behind it??? This the model 8115 "Cadet Army Command Car" 1983 Bronco II made by NYLint Toys in 1983.